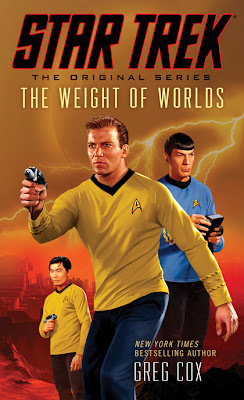 Kirk and Spock are stuck in another dimension for most of the book; Sulu is trapped behind enemy lines on his own, getting to do some hero stuff; and Uhura ends up taking command of the Enterprise, which was way overdue I felt. The basic theme of the book, which I tried to keep finding ways to work in, was basically to pit good old fashion Star Trek multi-multiculturalism, against absolutism, purism, religion fundamentalism. Star Trek has always been very much about diversity, combinations, meeting different races, and not assuming humanity has the answers to everything. The opposite of that would be my villains, who are basically evil religious fundamentalists from another dimension. They discovered their dimension was not the only dimension, and that was just a huge trauma to their society. They lived in a dimension where in fact they were the only intelligent race. Big cultural jolt to the system that was producing a big cultural backlash. Cox also mentioned he is currently discussing another Star Trek book with Pocket. It really was sparked by the desire to do a true science fiction novel within the Star Trek universe. I had been doing some reading that pertained to some of the concepts explored in the book, and wanted to dig into those. Plus I wanted to pit Kirk against some rigidly bureaucratic types, just for fun. The Weight of Worlds: Amazon.com, Amazon.co.uk, Amazon.ca, Amazon.de, Amazon.fr, Amazon.es, Amazon.it, Amazon.co.jp, Forbidden Planet. 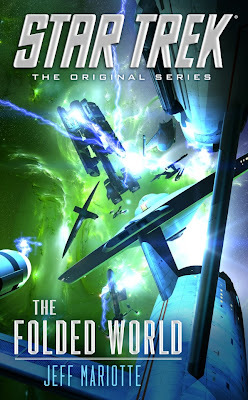 The Folded World: Amazon.com, Amazon.co.uk, Amazon.ca, Amazon.de, Amazon.fr, Amazon.es, Amazon.it, Amazon.co.jp.